In the early days of business-to-business e-commerce, companies housed product in marketing catalogues, enterprise resource planning systems or in the heads of salespeople. The data in ERP and other systems was typically only meant for internal use, and items like descriptions and attributes (often abbreviated) were too cryptic for customers to understand. Today, many B2B companies are seeking to create online customer experiences that meet the expectations and needs of their customers, and corporate ROI goals. But that requires high-quality data and content from a variety of sources. For example, to create a simple product detail page, you need marketing-ready descriptions and product attributes, high-resolution images, inventory, complex pricing, attachments such as material safety data sheets, or MSDS, and product spec sheets, shipping restrictions, and the list goes on and on. To manage this increasing complexity, Forrester Research Inc. explains that businesses are looking for B2B commerce solutions with a complete suite of back-end tools to drive growth in online B2B channels, not just front-end features. Product information management, or PIM, is one of the three core capabilities that businesses look for when comparing B2B commerce solutions. However, PIM is often confused with product catalog or content management, otherwise known as PCM. There are many solutions that position PCM similarly to PIM, adding to the confusion. Despite common assumptions, there are vast differences between the two. 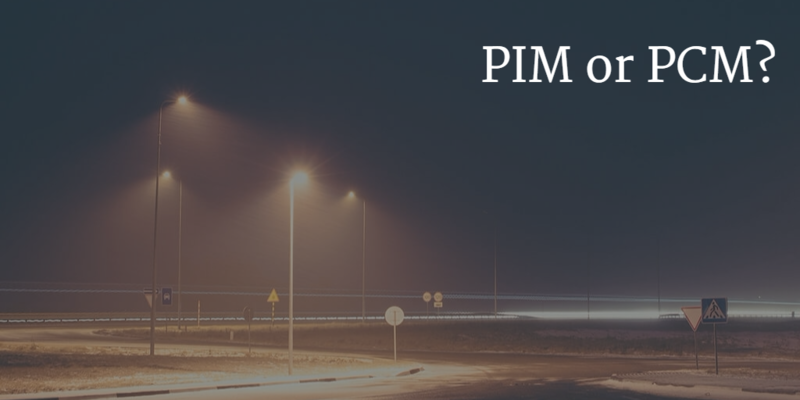 This raises the question, what separates PIM from PCM? PCM is a standard feature in most enterprise e-commerce solutions and primarily offers data enrichment. Enrichment means the ability to add or edit product descriptions, attributes, images and data taxonomies, and these capabilities are fantastic for managing a single source of truth for product information. Syndication – push data out to all types of channels, partners, and customers. As we worked recently with a distributor on identifying which of these types of systems to evaluate, it became clear to us that they needed to aggregate product information from all of their vendors and data providers. This data was in multiple formats and needed to be normalized, categorized and inspected for quality. In this case, the distributor’s data quality and aggregation requirements clearly made the case for an enterprise PIM. For many distributors, data aggregation and quality needs will drive the decision between PIM and PCM. Another example comes to mind of a manufacturing company with the opposite needs. This company, instead of aggregating data from multiple sources, needed a PIM to syndicate data to its distribution channels: online sites, print, data aggregators, and customers. In the process of syndication, the company needed data quality processes to clean its data as per the requirements of each channel. Many manufacturing companies will identify similar needs, and, therefore, syndication and data quality will drive their decisions between PIM and PCM. Although the distributor and manufacturer examples are fairly standard, there is more to consider when selecting an enterprise PIM. It is important to understand what each platform will do for you and to ask the right questions of your organization to make the right decision. If you already have data aggregation, data quality, and syndication tools, a PCM may be all your organization needs to enrich your product data. But, if your organization is struggling in these areas and needs a single system of record and governance around large product catalogs, it is probably time to look beyond your e-commerce PCM solution to an enterprise PIM that can meet your entire organization’s needs.